The Australian Banana Growers’ Council has organised two North Queensland meetings this week to discuss recent concerns around WH&S regulations. The meetings will take into account improvement notices issued to some growers around Innisfail in recent weeks. A WH&S specialist and a Queensland inspector will be attending to address any concerns and answer questions. All growers are welcome to attend. Growers looking for the legislated requirement in regard to WH&S in Queensland could check the actual provision available via our website here. Through the #PanamaTR4ready campaign, Biosecurity Queensland with the support of the Australian Banana Growers’ Council, are calling for the community at large to come together and be Panama TR4 ready. The #PanamaTR4ready campaign will use television, radio, press, and social media to encourage people to visit www.panamatr4ready.com.au to find out what they can do. Australia’s country of origin labelling system has been reformed and the transitional period is over. From 1 July 2018, all businesses must comply with the new country of origin labelling requirements for food products sold in Australia. The Australian Competition and Consumer Commission (ACCC) has produced a wide range of resources that you can read, watch and refer to regarding the new labelling system. Read more here. Given the strong consumer interest in health and nutrition, Hort Innovation was keen to identify the natural nutritional profile of bananas and to leverage this as a component of the marketing program. Nutrient data was sourced from the Food Standards Australia New Zealand NUTTAB Database to form a table in June. 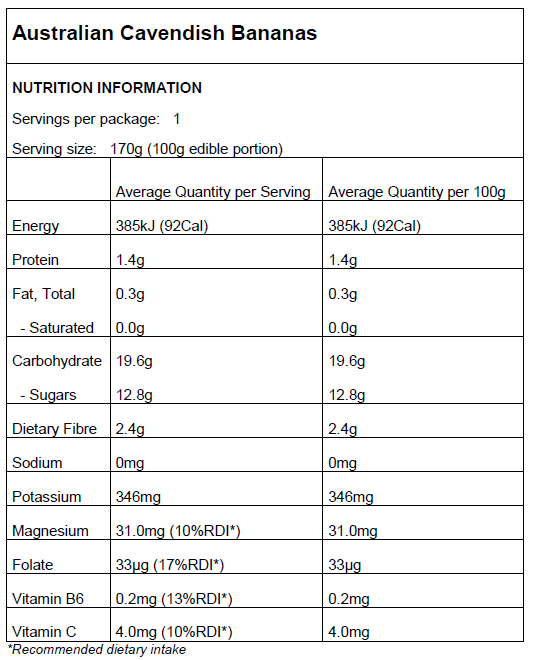 That table, below, provides the nutritional profile of Cavendish bananas in the standard format as required by Food Standards Australia New Zealand when labelling foods at point of sale. The Nutrition information panel was completed by Food and Nutrition Australia in June 2018. Congratulations to Alan and Julie-Ann, of Rum Jungle Organics! The Territory team have been named a finalist in the 2018 NT Telstra Business Awards, in the Small and Succeeding category. Winners will be announced on August 8, so we’ll be sending them plenty of good wishes! It’s been a great year for Rum Jungle Organics, who won a Farm Biosecurity Producer of the Year award earlier in March. In the time it takes to make a coffee, you could be well on the way to completing a free membership with Hort Innovation. You may have recently received a two-minute membership form in the mail – or you can access it online here – and ABGC encourages all growers to consider signing up. Membership gives you a better insight into industry investments, horticulture news, event opportunities and voting rights. If you didn’t receive a printed copy of the two-minute membership form, and would like one, call the ABGC office on 07 3278 4786. Are you ready for the Roadshow? With just over a week until the National Banana Roadshow begins, we urge growers to come along and take up the opportunity to hear about the latest research and development. The first roadshow presentation will kick off in NSW and will be held in Murwillumbah on Tuesday 24 July, with Coffs Harbour to follow on Thursday 26 July. For Queensland and WA events contact Shanara Veivers (DAF) at shanara.veivers@daf.qld.gov.au or phone/text 0400 870 731. For NSW events contact Matt Weinert (NSW DPI) at matt.weinert@dpi.nsw.gov.au or phone/text 0438 644 136. The strategic levy investment project National Banana Development and Extension Program BA16007 is part of the Hort Innovation Banana Fund. The project is funded by Hort Innovation using the banana research and development levy, co-investment from the Queensland Department of Agriculture and Fisheries and contributions from the Australian Government. Hort Innovation is the grower-owned, not-for-profit research and development corporation for Australian horticulture. Also, it is important for membership purposes that growers advise ABGC if they change trading name or their agent (wholesaler) or add one, and also to let their agent know. Our e-bulletin is distributed to our subscribers. Update your preferences below, or if our e-bulletin has been forwarded to you and you would like to join our subscription list, please email Communications Officer Amy Spear at amy.spear@abgc.org.au with your contact details. Next PostAre you Panama TR4 Ready?